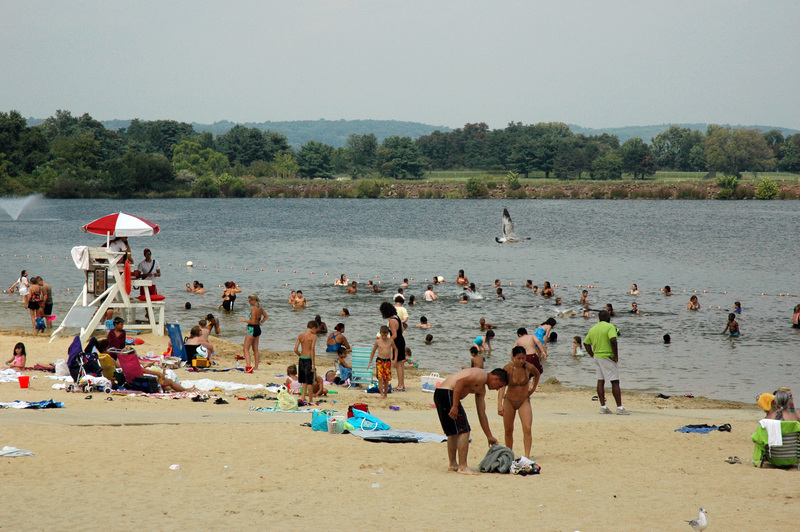 (12/P82) TRENTON – Nestled in the rolling hills of Hunterdon County, the Round Valley Recreation Area protects New Jersey’s second deepest lake – and a world of natural beauty. Surrounding the lake are pristine eastern woodlands, habitat for a wide variety of wildlife from hawks and eagles to deer and bears. If you’re lucky, you may even see the faint foundation of a Revolutionary War-era farmstead or a remnant fruit tree from the orchards that once graced the area. With all this plus its pristine, deep lake, the Round Valley Recreation Area is truly a hidden gem of the State Park System. 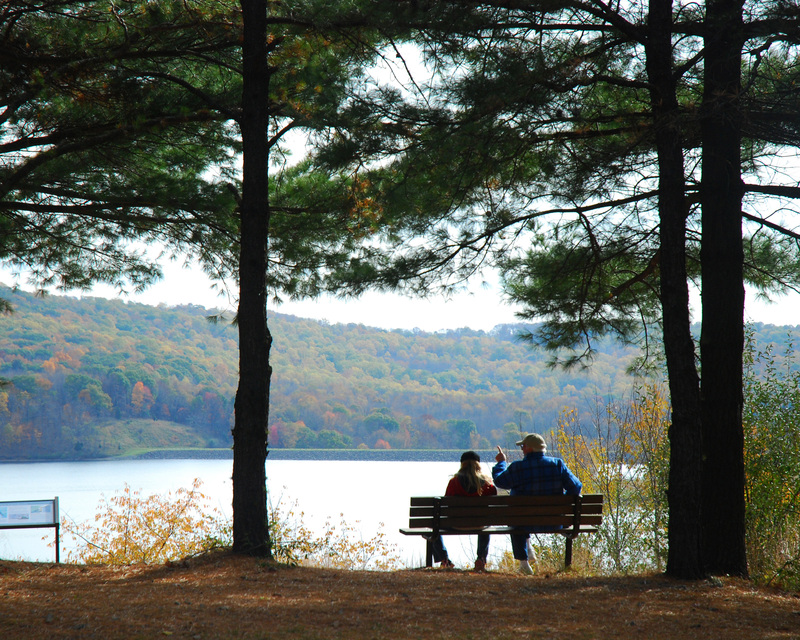 Recreational opportunities at Round Valley are as diverse as the natural beauty the state recreation area preserves. Visitors can experience the tried and true hiking, swimming, fishing and picnicking. Or they may try something more adventurous, such as wilderness camping, mountain biking, ice-fishing, even scuba diving. The Christie Administration recognizes the importance of keeping New Jersey’s parks such as Round Valley open, affordable and even more accessible, late last year launching a long-term strategy for keeping parks sustainable for future generations by improving visitor services, amenities and activities. This two-phase strategy creates a long-term sustainable stream of funding without having to rely on additional state taxpayer funds. The goal of the first phase is to increase non-tax resources to $15 million by 2015 through an initial round of partnerships with private sector and non-profit organizations and environmental foundations at some of the state’s largest parks. The longer term goal of the second phase is to raise about two-thirds of the annual operating budget for the park system from alternative funding sources, thereby greatly reducing reliance on the state budget while increasing overall park funding. The State Park System encompasses 440,000 acres in 21 counties, including more than 500 miles of hiking and riding trails, and 10 miles of beaches. It includes 39 active recreation areas with year-round operations. In addition, more than 50 historic sites are attached to parks, including historic districts, villages and battlefields. The Round Valley Recreation Area officially opened in 1977. The state started acquiring land in Round Valley in the late 1950s for a reservoir to supply water to Newark. Farmers who lived in the valley lost their homes or relocated. Many moved their homes off their foundations and sent them to Valley Crest Road near the park, where they still stand today. 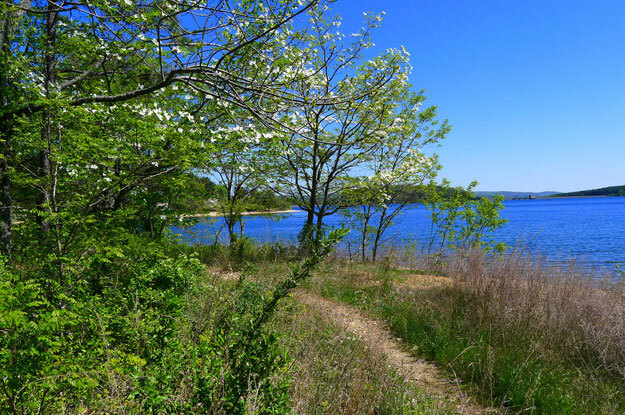 “The heartbreaking sacrifice of a few has provided recreation, and life-giving water, for many,” Hunterdon County Historian Stephanie Stevens has written in her history of the Round Valley Reservoir, Beneath These Waters. The lake itself was created by the construction of two dams, but the pipeline that was to provide water to Newark some 35 miles away ran into controversy and was never built. The reservoir sat unused for a number of years. The state eventually decided to begin developing the reservoir for recreational use. Today, the New Jersey Water Supply Authority utilizes the reservoir as part of its vast network of water supplies. For park naturalist Jim Tubman, Round Valley’s stories are told in the subtle traces of a farmhouse foundation, a lone apple tree standing amid a forest of oaks, even the deep, blue waters of the reservoir itself. Lore holds that Cushetunk is the Lenape word for wild pig. The Cushetunk lives up to its name. But not to leave the young ones out, the Family Hike and Bike Trail is a half-mile loop through peaceful pine woods that offers an introduction to mountain biking on kid-suitable terrain. Another activity that is fun for all ages is sledding. In the winter, the recreation area’s sledding hill can take on the appearance of “a little ski resort, with people turning out in their snowsuits with sleds, saucers and tubes,” Russ said. Round Valley is also one of a handful of parks that offers true wilderness camping, with campsites reached only by canoe or boat – or by a three-mile hike or bike ride along a steep and rugged trail. 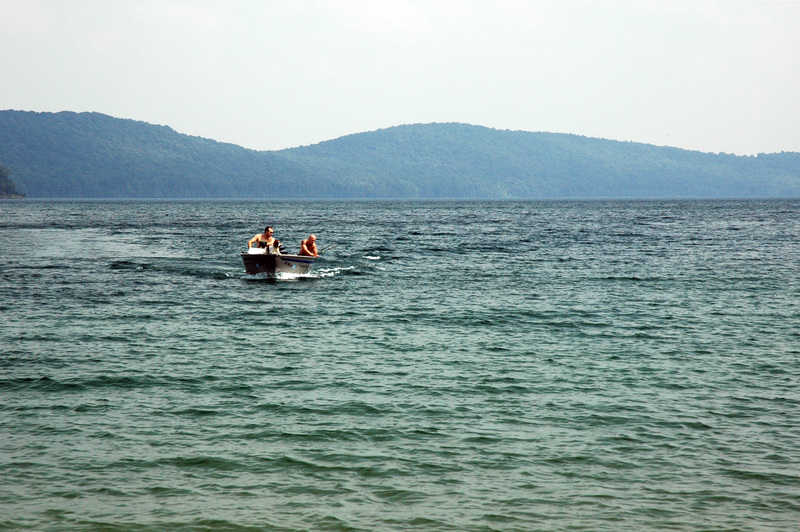 The calm and deep waters of the lake provide an ideal environment for scuba divers and training schools. Divers accompanied by dive masters use a platform submerged in about 20 feet of water to train. There are no shortages of ways to become immersed in this world of natural beauty and history. The recreation area boasts a fine network of hiking, biking and riding trails to complement its swimming beach, boat launches, food concessions and playground. While the beach and picnic areas are the major draw for park visitors, the trail network, geared for every hiking level, provides access to Round Valley's wilder side all year long. 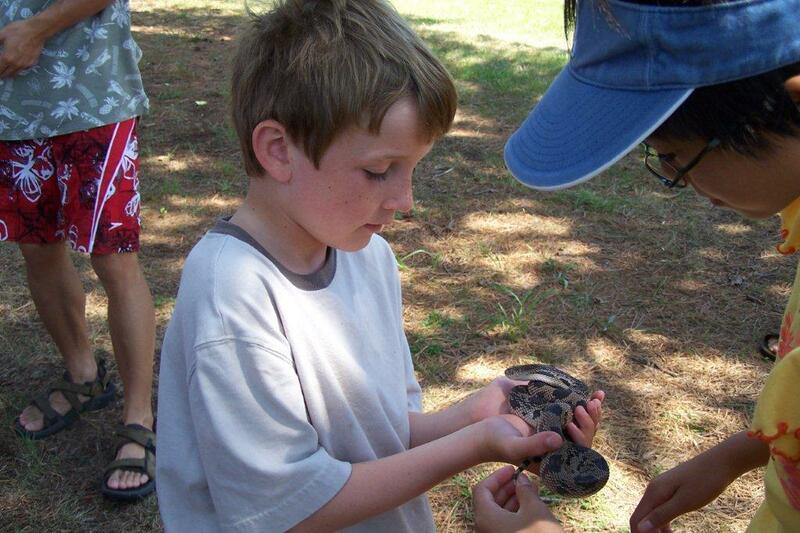 These trails serve as the backdrop for programs on geology, history, wildlife and plants geared to each season, including the popular Raspberry Ramble held on the first and second Sundays in July. Although no trails encircle the reservoir, there is no shortage of views of it from the Blue, Cushetunk, or Toboggan Hill trails. The Tobbogan Hill Trail is a steep but short hike to one of the highest points in the park, offering sweeping views of the reservoir and surrounding hills. The nine-mile (18 miles round trip) Cushetunk Trail and three-mile lower service road trails are multi-use trails that pass through open and heavily wooded trails. Round Valley Recreation Area is located south of Interstate 78. Take I-78 west to exit 20 A to Route 22 west, follow signs to the park, or take I-78 east to exit 18 (Route 22 east), and follow signs to the park. Learn more about New Jersey’s park sustainability plan.